Harleen Quinzel was born in Brooklyn, New York, to a middle class family. Her mother was a waitress, her father a sometimes day laborer, most of the time con-artist and drunk. A deadbeat brother and a sensible sister. Stability was Harleen's first obsession, chance gave Harleen the mind of a genius, then stuck her with a manic nature and a co-dependant personality. In school, Harleen excelled, filled her life with ballet, gymnastics, and study. Born to a chaotic world, Harleen turned every effort to perfect order. Harleen sought to understand her world through people, she worked her way to NYU and completed first a psycology degree, then won her way into NYU's medical school. She graduated in the top of her class. So remarkable was the new psychiatrist's skill that she took a job infamous Arkham Asylum. Harleen was absolutely devoted to the impossible, curing the world's most twisted criminals. Unfortuately, Quinzel was already near a breaking point herself. 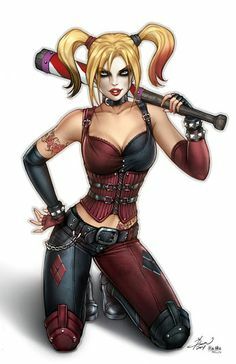 She took over the worst of the worst, pawned off on the young optimist, including the Joker, who was able to turn the tables on Dr. Quinzel, "helping" her to understand insanity. Harley Quinn was first born as an attempt to empathize with the costumed crazies on their own terms. Student loan debt, and other stresses of her perfectionist nature eroded Harleen's psyche. A few mysterious gifts cleared her debt. And Harleen's plans to write a book on the Joker and the reformation of other inmates and patients was stolen by her supervisor. Furious, Harleen took her issues to the Joker, who consoled her, talked her through (into) a breakdown. He revealed himself as her secret admirer. Harley then helped the Joker escape, in return, he kindly killed her supervisor. Guilt ridden and broken, her life unraveling, Harleen flipped. Chaos was freedom, life. Harleen became Harley in more than disguise. After years as Harley Quinn, Harley found herself stuck in Arkham as an inmate and patient for not the first time. Then came the Reign of Terror, Harleen was recruited by a special secret team. There were dark things done in the shadows of the Reign of Terror War and following. The Suicide Squad did the necessary evils shiny heroes would not. It was during this time that Harleen acquired the PI (Physical Invictus) Serum while raiding <information redacted>. The variation of the numerous "super-soldier" research projects greatly enhanced Harleen to extraordinadry level. Once finished with missions that are still classified and redacted, Harleen was returned to Arkham. During the rebuilding, Harleen Quinzel was freed from Arkham, marked sane and reformed, her deal from the Suicide Squad. Quietly re-entering society, and obsessed with keeping her freedom, Harleen reviewed her life. Seemed like time for a change. Not everything the Suicide Squad did was bad, and Harley really liked helping children, being praised for doing the right thing, and having earned something at some levels independently. Let's Get Physical: Harleen was a natural at gymnastics and quite dexterous. When she took the P I Serum, her physical abilities were considerably increased. White and Nerdy: Harleen Quinzel is a mad genius, but a genius just the same. When not in a funk, she is highly perceptive, able to take advantage of her surrounding and any weakness in her foes. Her numerous mental illnesses make her brain hard to crack or control, especially her compulsive and obsessive nature. She has aptitudes in medicine, chemistry, and psychology. She has the insight of a trained observer and she is a quick study. Bette Davis Eyes: Harley has mad skillz. She is an expert at disguise, escapology, and deception. A trained criminal and psychologist, her time has trained her well. She can break into and out of nearly anything. She can pick locks (mechanical or electrical.) She can slip through a police net or a security patrolled area. Eye Of the Tiger: Harleen is a scrapper. A natural athlete, Harls took to street fighting, boxing, knives, sticks, and guns. She has impressive boxing and kick boxing skills. She fights rough and dirty, targeting weak point, using her environment, and improvising quickly. Sledge hammers, baseball bats, and mallets are among Harleen's favorite weapons. She is a skilled gunner in a firefight. Knives, Harleen can fight in close, or throw them precisely. Smooth Criminal: Harley Quinn knows the Gotham Criminal Scene like only its Comic Queen could. The fences, the mafia, the costumed villains, ex cons, and the gangs. Harley Quinn has a seemingly limited supply of weapons, both serious and gag. However, owing to her impulsive and compulsive nature, she seems to go through money as fast as she gets it. There is no question, she's nuts. Harleen possesses a buffet of mental illnesses. Schizophrenic: The voices in her head sing sweet songs and whisper naughty thoughts. Harls totally hears them as well as has delusions and hallucinations. Psychotic Breaks: Harleen is prone to going wild in sudden bursts off vengeance and anger. She is not a true psychotic: Harleen is definitely capable of empathy and has demonstrated such on many occasions, a disqualifier for true psychotics. Bi-Polar: Quinzel has her manic highs, and frequently, losing sleep and charging boldly forth with a grand sense of optimism and humor. Until she doesn't, Harleen can be her own greatest critic, she despises disappointing people and this throws her into self-destructive introspection. Co-Dependent personality: Harley needs a partner desperately, or a leader often. She makes a great side-kick, immensely loyal, brave and self-sacrificing. However; Harleen needs justification, reassurances, and build-up. Dissociative Personality Disorder: Harleen Quinzel, Harley Quinn, Batty-girl, and Doctor; they are not the same person. Doctor Quinzel is a dedicated healer, and sympathizes as well as empathizes with her patients. Harley Quinn is a twisted and demented relativist, excusing horrible acts as loyalty or serving a higher calling. Harleen Quinzel is hedonistic, and bubbly, she also an intelligent sometimes geeky funny girl. Batty-girl is a woman on a mission to redeem herself, dedicated to proving she can be a better-self. She is the least defined of the voices, and the youngest. Etcetera, Etcetera. Harleen has many minor personality quirks such as OCD, Anger management issues, addictive personality, and others. I Fought the Law: Harley Quinn was a major criminal, near terrorist. She killed many people, robbed more, injured yet more. While she is 'reformed' now, there are many who would love to see Harley put down or buried. She has tons of enemies, master villains, minor villains, thugs, punks, cops, victims, heroes, and especially insurance companies. Dr. Harleen Quinzel is a known commodity, her time as Harley Quinn is public record. She is one mistake away from Arkham at any second, and is watched by many who would help her fall. There is more than one cop that would shoot to kill. Most of the Bat-Family distrust their old nemesis. Other hero types, forget about it. Might Be a Lunatic: Actually, there is no question, she's nuts. Harleen possesses a buffet of mental illnesses.